Thomastown United's last result was a disappointing 0-2 loss at home against Bridge United. Freebooters AFC has yet to win in this competition, having lost all 2 games. Thomastown United despatched by Bridge United. Thomastown United are defeated by Freebooters AFC. 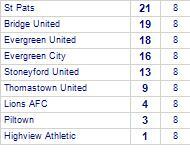 Freebooters AFC are currently on a winning streak of 6 games.They have won 6 out of 7 away games. Thomastown United take spoils against Deen Celtic.